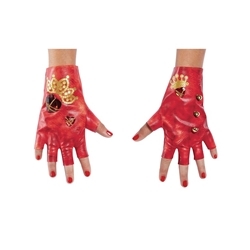 The Disney Descendants Evie Gloves include one pair of Child Size Red and Gold Gloves as pictured. These officially licensed gloves are perfect for the character Evie from Disney Descendants 2: Isle of the Lost. The fun red and gold color scheme can also be great for many other characters, whether for your next Cosplay convention, or for Halloween!